A workshop based around the journey from ‘Tree to Heat’ was held at Wakelyns Agroforestry in January 2017. This workshop was part of an EU-funded project, SustainFARM, which aims to investigate the economic and environmental performance of both traditional and innovative agroforestry systems. ORC researchers Sally Westaway and Samantha Mullender report on an action-packed event which combined machinery trials, demonstrations and a farm tour together with a workshop to help identify sustainability indicators for agroforestry systems. On a beautiful cold crisp morning in January 2017 we were greeted by several large machines making their way down the farm track to Wakelyns Agroforestry; they had come to take part in ORC’s agroforestry coppicing trials and to give a live demonstration as part of a stakeholder workshop. Wakelyns, an innovative agroforestry farm in Suffolk, is one of the UK case study farms for the SustainFARM project. The farm, established in 1994, incorporates a mature field boundary hedgerow network, willow and hazel short rotation coppice (SRC), mixed timber and fruit trees intercropped with organic arable crops and vegetables. This diversity makes Wakelyns an ideal trial site for investigating the management and production of multiple non-food products from a range of different agroforestry systems. The aims of this trial were to compare the different agroforestry systems in terms of the logistics of woodfuel production, including appropriate machinery and methods; the length of rotations, cutting age and the productivity of different tree species/systems; and to investigate methods of increasing woodfuel quality. Traditional boundary hedge: an unmanaged mature mixed species hedge last cut approximately 21 years ago. Hazel SRC: originally planted in 1995 the hazel stools are grown in double rows in an alley cropping agroforestry system and coppiced on a 5-year rotation. Pollards: a selection of trees in the timber rows have been pollarded two and three years ago at various heights, more have been pollarded this year as part of these trials. The trees are pollarded at c.20-22 years. The machines used to harvest material from these systems include a set of 360 degree tree shears mounted on 7.5 tonne excavator, operated by Nigel Stimson; and a Bracke C16.c accumulating felling head with a circular saw cutting blade mounted on a purpose built Valmet 901.4 operated by Martyn Neve of Even Forestry. In addition, the pollards were cut manually using a chainsaw and some of the SRC was also cut using a tractor mounted circular saw. After cutting, material was left to dry in the field, to be chipped/processed in summer 2017. 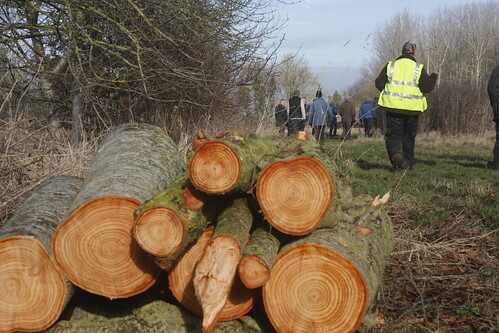 The speed of operation of each machine was recorded as the length of hedge or SRC coppiced in a 30 minute period. The cleanness of cut and any damage to the stools was also recorded along with overall fuel use and any comments from the contractors and workshop attendees. Re-growth of the hedge and SRC coppice stools and the pollards will be monitored at the end of the 2017 growing season and repeated annually for the next three years. Samples of the chip from the both the hedge material and the SRC will be collected post-drying and tested for particle size distribution, ash content and total calorific value. The differences in quality can then be assessed against the costs of each operation. The volume of chip produced from the hedge and SRC will be calculated when it is chipped to give a measure of productivity of each of the systems. The quantity of material cut from the pollards will also be measured. An economic analysis of woodfuel production for each different harvesting method and agroforestry type will also be carried out. The Bracke felling head coppiced the hedge nearly twice as fast as the tree shears, but as a specialised machine it was approximately twice the cost of the tree shears, excluding haulage. The Bracke also struggled a bit to cut the larger hedge trees and had a tendency to uproot smaller single stemmed trees. However it was quick and efficient at cutting the SRC and had the advantage over the tractor mounted circular saw usually used on the farm as it was able to place the material in neat piles to be collected up and chipped at a later date. The tree shears, although working more slowly, managed to coppice most of the hedge trees well; due to some stem splitting there was a need to go through the hedge after coppicing to ‘tidy up’ the stumps manually with a chainsaw. However, the shears did not cope well with the SRC coppice stools: the diameter of the stool was too wide for the shears and there was concern that the coppice stool root ball was being moved around and might be damaged, so the trial was abandoned after cutting 10 stools. Neither of the bigger machines were used for the pollards due to concerns over unnecessary damage to the ground caused by manoeuvring to individual trees and the need to tidy the trees up afterwards with a chainsaw anyway. Instead, the pollards were cut by hand with a chainsaw. In some situations, and where volumes of material to be cut are small, nothing is going to beat the flexibility and cost of manual cutting using a chainsaw. With any bigger machine haulage adds a significant amount to the cost of the operation and the decision as to when the more expensive equipment becomes cost effective will come down to the scale and location. If the Bracke was relatively local it could be moved on the road with a tractor legally, so subject to distance this may make it more cost effective. Data collected from the different Wakelyns agroforestry systems will be combined with data from the Elm Farm SustainFARM trials and with previous trial data to help build up a more complete picture of the economics of different on-farm wood fuel production methods from different agroforestry types. Regrowth and yield data from the three agroforestry systems will be combined with existing data to produce productivity curves under different conditions and a set of guidelines for farmers on how to maximise production. Alongside the trials we ran an event for stakeholders and the general public. The event was an opportunity to see the machinery in action and to meet the contractors and talk to them about practicalities. The day was attended by 27 people from a diverse range of backgrounds and lots of interesting discussion were had. In the afternoon a workshop was held to help develop a tool to assess the sustainability of agroforestry systems. The session provoked much discussion of what ‘sustainability’ means and how best to measure it. The results were combined with those of similar workshops carried out in four other European countries to generate a final online survey. The answers from this will now be used to adapt an assessment tool – the PG Tool – to enable it to carry out sustainability assessments of agroforestry systems.